Uncertainty seems to be the only hard and fast rule of adventure. I had originally planned a short ride on the KLR for Saturday to find some dirt and break in the new tires. Sunday I would meet up with a buddy to do a little exploring and check out some rarely visited ruin sites north of Phoenix. All in all, a solid weekend of outdoor fun. Then the shop called and said I wouldn’t have my bike back before Saturday. Great, there goes my Saturday plans. Then I got a message that my buddy came down with some kind of flu and had to bail on our Sunday excursion. My weekend of adventure was falling flat. I spent Saturday getting caught up on some things around the house, which was far more practical use of my time but had all the excitement of getting a box of no. 2 pencils for Christmas. By Saturday night I was still trying to decide if I would explore the ruin sites solo, or do something else and wait for my buddy to recover. He’s as much of a history nut as I am and we usually team up to hit new ruin sites, so I finally decided I would wait on those and, instead, head out on the KLR for a substantial ride. Well, substantial to a new rider like me at least. If you take Cave Creek Road north out of town and drive until you run out of pavement, that’s Seven Springs Road and Forest Route 24 (also known as Camp Creek Road). The approach brings you up Cave Creek Road through some of the most prestigious luxury golf course communities in Scottsdale like Desert Mountain, Mirabel and Tonto Hills. Shortly after that you’ll reach the turn-off for Bartlett Lake and the Tonto National Forest Ranger Station. Just past the Bartlett turnoff any traffic drops off considerably and you’ll essentially have the road to yourself. At least I did on Sunday. Last year I did a backpacking trip into Tonto National Forest toward Skunk Tank north of Cave Creek. We backpacked in from Seven Springs, spending a night in the desert along the creek and then packing out. That was the last, and only time I had driven up Seven Springs Road. There is a short unpaved portion of the road before reaching the trailhead, but I really hadn’t made it out to the true dirt roads of FR24. Other than a little map research and a vague general knowledge of the area, I had no idea what kind of conditions I would find or whether I would be able to handle them when I got there. Being new to this bike, I don’t yet have a lot of confidence in my skills. As I mentioned in the last post, I hadn’t really been on a motorcycle for 6 or 7 years before buying the KLR and I never really drove much dirt. This whole Dual-Sport Adventure Motorcycle business is entirely a new thing to me. I headed out anyway, determined to gain some experience on dirt roads. 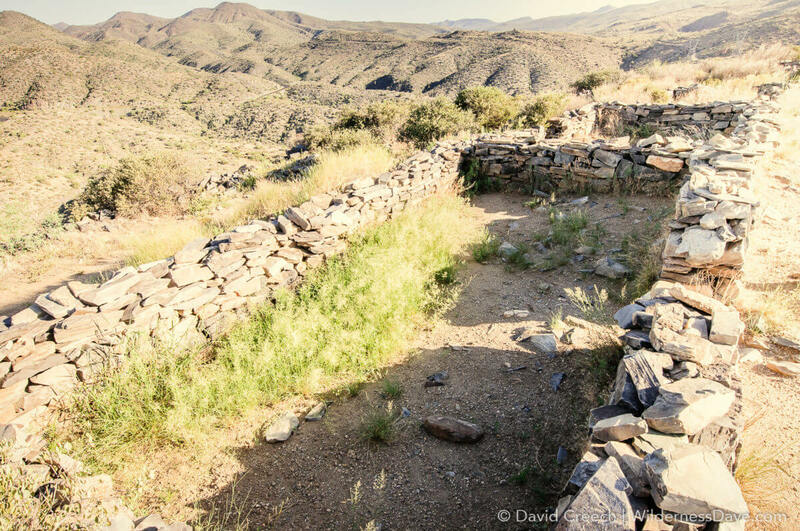 Just past the turn-off for Bartlett Lake is a small Hohokam village ruin site known as Sears-Kay. 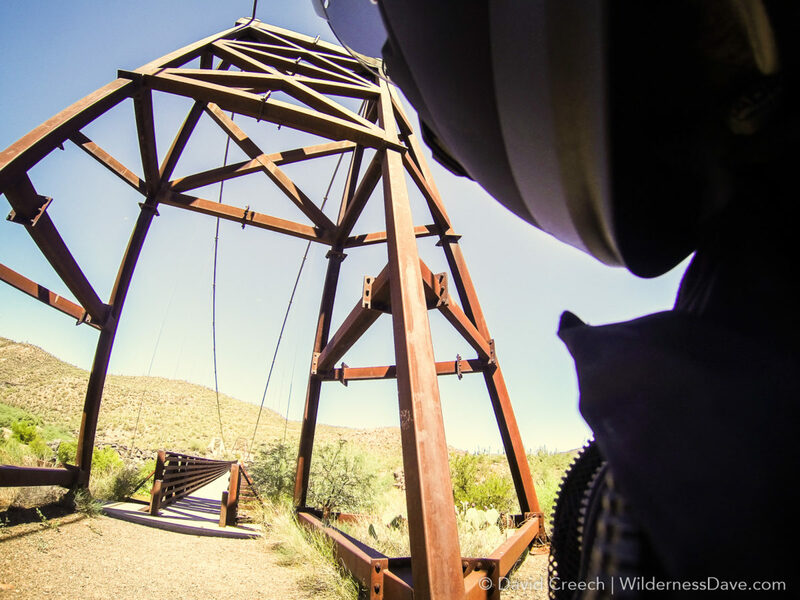 It is one of many sites dotted along the Verde River and it’s tributaries like a long chain linked by one of the only continuous water sources in the state. The sign on site says that Sears-Kay is nearly 1000 years old, but other sources argue it was first occupied as late as 1500 AD. The hilltop site was discovered in 1867 by soldiers from nearby Camp McDowell and later named after J.M. Sears who founded a ranch nearby in 1887 called Sears-Kay Ranch. Early on this particular Sunday morning I pulled into the parking lot for Sears-Kay and found it completely empty. 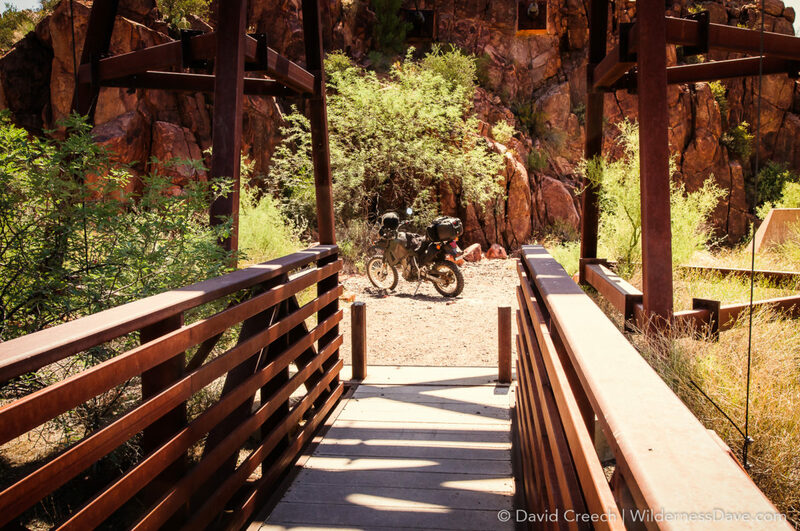 I parked near the trailhead and turned off the bike only to be engulfed in complete silence. After stashing my gear and grabbing my camera I casually headed up the trail enjoying the peace of a morning alone in the desert. I made short work of the easy 1 mile trail and took my time walking among the partially reconstructed dry-stack stone walls. Some recent summer storms had brought moisture to the desert and the site was ripe with smatterings of color from seasonal wildflowers. I didn’t stay at Sears-Kay long. I was anxious to get into the backcountry and a little worried about letting it get too late, too hot and too crowded. I drove the rest of the way up Seven Springs Road switched between pavement and dirt as it twisted it’s way back into the canyons. Eventually the pavement, and the people, completely faded away and I had the desert to myself. 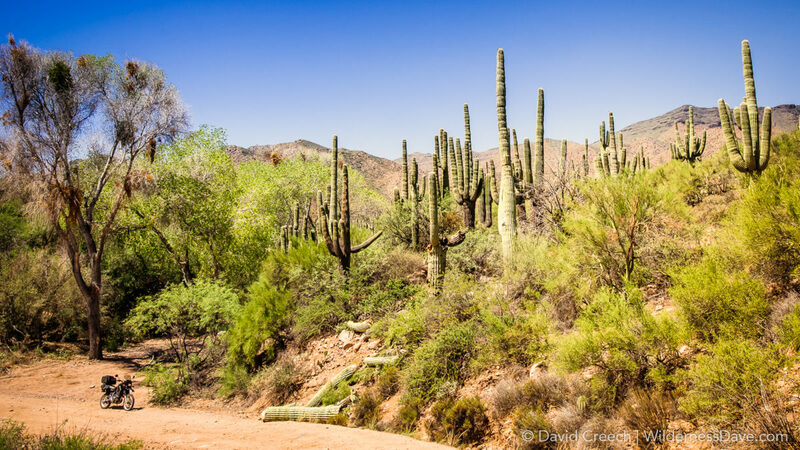 One of the things I’ve always loved about hiking in Arizona is getting back into the untouched desert environments. 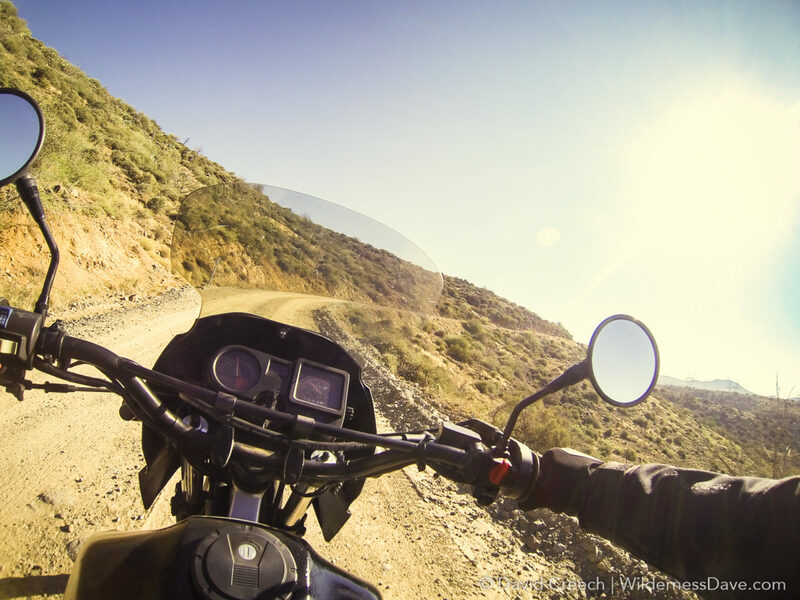 The KLR offers a similar experience but allows me to see much more of the desert in a shorter time and get much further back into remote areas I wouldn’t get to otherwise. 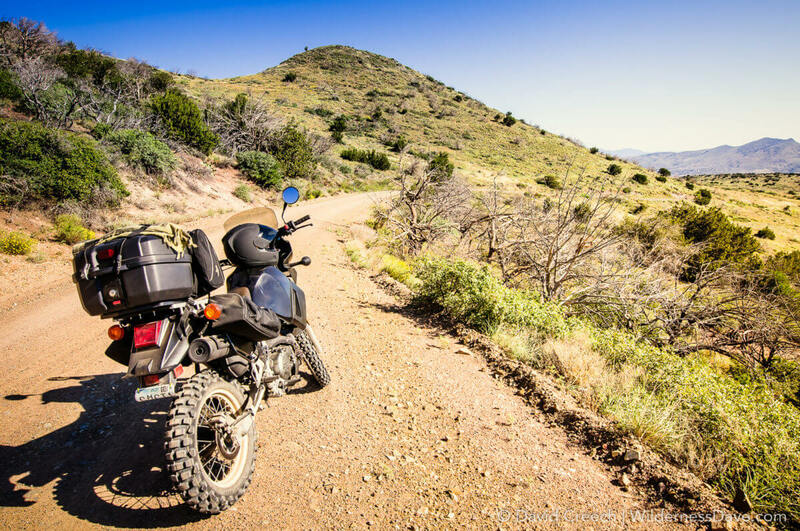 Ultimately, I’ll start combining hiking trips with motorcycle trips for a deeper look at Arizona backcountry. As I rode down FR24 I kept a pretty moderate pace, still a little tentative about riding on unstable surfaces, which allowed me too look around a bit and enjoy the scenery. I stopped often to take pictures, explore a little side trail, or just turn off the bike and enjoy the amazing views in silence. FR24 is a pretty well maintained road and was perfect for feeling out the bike. The hardpacked dirt was decent and not overly rutted out from storms, no muddy pits, no loose sand. It was a fun, easy, twisty bit of fun that I was really starting to enjoy. I expected FR24 to be more active on a Sunday morning with other traffic but I did not see another vehicle the entire time I was on this road. The solitude was an unexpected bonus and, at the same time, a little spooky in case of something going wrong. FR24 (Camp Creek Road) ends at a T junction with FR269 (Bloody Basin Road). At the wide intersection there is a sign post showing the mileage along Bloody Basin Road to I-17 going west and to the Verde River going east. There is also sign at this intersection that talks about the Great Western Trail, a 3000 mile backroad route from Mexico to Canada. Apparently, the Arizona section of this trail uses Camp Creek and Bloody Basin to work it’s way north. I had the choice here to turn back, but I was making a day of this and it was still early. Besides, I really wanted to get out to the Sheep Bridge and put my feet in the Verde River. FR269 is a pretty nice road as well, until the first creek crossing. Tangle Creek is the first big creek crossing and the first place I saw other people all day. A guy in a big 4×4 bronco was stuck in the soft sand of the creek and an older gentleman in another truck was working to help him get free. They had most of the creek blocked but as I approached they waved me through and darted around them praying that I wouldn’t bite it on my first creek crossing…especially with an audience. Coming up on the wide creek I could see tons of loose sand, river rock and mud and I really didn’t know what the bike would do or how I would handle it. JUST DON”T FALL. I gunned it through the creek, goosing the throttle a little so I could maintain some speed and the KLR cut a path through the sand and over the rock without a hitch. YES! After Tangle Creek the road progressively got worse. There were two or three other creek crossing with the same loose, wet sand and every time I crossed one the road on the other side deteriorated a little. I eventually got used it, even started to enjoy the feel of the bike hoping around and finding traction on the rocky surface. It felt good to dial in and get a real feel for how the bike handles on terrain. I finally rounded a corner and caught my first look at the Verde River and the Sheep Bridge in the valley below. The structure is pretty cool and as I approached I found it interesting how natural the setting felt. This man-made structure in the middle of the desert at the end of a long dirt road didn’t seem out of place at all, it made sense. As I cruised down the switchbacks toward the bridge I passed a small corral and the old concrete slabs of structures that once stood near the bridge. I rode up to the bridge itself, designed as a footbridge, and for a split second debated if the structure would really hold me and the bike. But there were tire tracks and the new bridge looked solid enough. The Sheep Bridge is a 476 foot suspension bridge originally built in 1943 then rebuilt in 1989. Remnants of the old bridge foundation are still there next to the new bridge. Our summer storms have been pretty active this year, making for some interesting developments in the creeks, washes and rivers around here and the Verde is no exception. It was obvious the water had come down after a recent swell had saturated the banks and flooded the riparian plants that line the river’s normal shoreline. The muddy brown water was flowing pretty good around the tight corner just upstream of the bridge, slowing where the river widened then picking up steam again as the river narrowed downstream. The Verde is normally a very pretty deep green but this turbulent muddy mess was a sign of recent weather upstream. I hiked down the little rock trail from the bridge to the gravel bar along the river. There was no one else around and I had the place to myself, at least for a while. The shoreline was a muddy, sticky mess and it looked like a couple of people had attempted to trudge through it before me. I chose to hike a little further down stream for something a little more stable. I found a spot where I could approach the river without sinking to my calves in muddy clay and dipped my head in the water to cool off. I sat listening to the river for a while. My time rafting in the Pacific Northwest has given me a keen appreciation of rivers and their unique character. I love the sound of moving water and find it to be the closest thing to meditation I have experienced. I eventually pulled myself away from the river, suddenly very aware of my water supply and the increasing heat. I passed two trucks on their way to the river as I rode back. Having left when I did, I kept my experience at the river unspoiled and was thankful for the timing. I noticed much more confidence on my return, riding a little faster, taking corners just a little harder, worrying less as I approached the sandy washes. 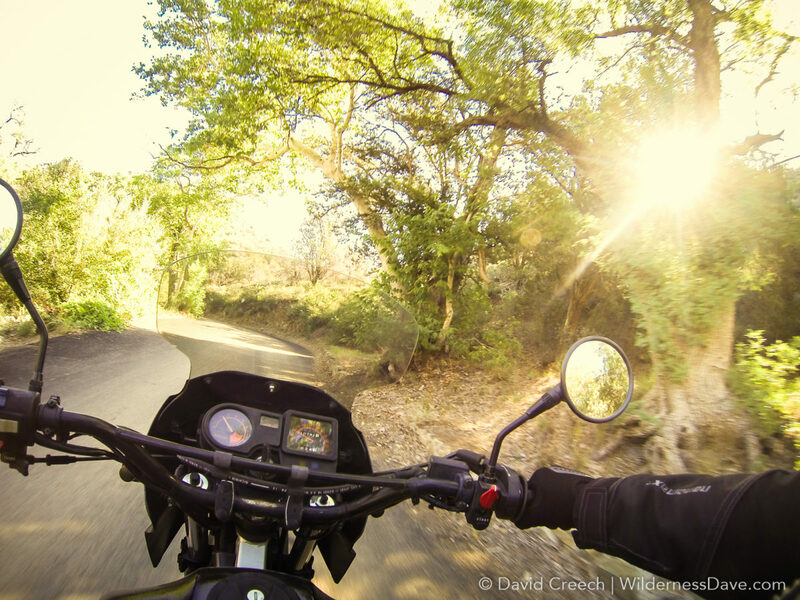 Once I hit the graded road on the other side of Tangle Creek I opened her up a little bit and cruised down the gravel road at a pretty good pace. Other than the two trucks near the river, I saw no one else on the road back. A few people had made it in and stopped at one of the many open camp sites along the road, but that still left me with the road to myself. Getting back home I started going through the pictures from the ride. I really enjoyed my Sunday morning adventure on the KLR and I am anxious to get back out there. There are a few things I learned on this ride that will allow me to be better prepared next time I go out. For one, I didn’t take nearly enough water. That’ll be remedied next time I head out. I had underestimated how long I would be out there, and I underestimated how dehydrated I would get sweating in my riding jacket and helmet. Dehydration could have been a big problem and I was feeling it’s effects as I wrapped up the ride. I had some emergency gear in case it became an issue but bringing more water is easy enough. Second, I was very under-prepared for a problem. I guess I expected to see a lot more people on these backroads and figured extraction would be easy. I need to bring some basic gear that would make upwards of 72 hours of survival easier to manage. It will likely never be an issue, but it will give me peace of mind to be prepared. Navigation was poor. Knowing the route I wanted to take, it wasn’t a big deal but when I get more confident on the bike I want to be able to explore more of the side roads, trails and washes. Better maps, GPS and a compass really should be part of my regular gear. Really, I need to treat these outings more like I would extended hiking trips and less like road trips. Food! I foolishly headed out without breakfast and didn’t bring a damn thing to eat with me. That was downright stupid and won’t happen again. Studying the area a little more now that I’ve been out there, I want to explore some of the other roads. Mount Humbolt, Maggie May Trail, Table Mesa Trail, New River and Bloody Basin are all now on the list. I want to look further into the Great Western Trail and how far north that will allow me to ride. I also learned that there are natural hot springs at the Verde River near the Sheep Bridge…reason enough to go back in Winter and make camp. The other direction on Bloody Basin Road is the Agua Fria National Monument, a 71,000 acres protected area created in 2000. There are supposed to be upwards of 400 archaeological sites within the Monument, some as much as 2,000 years old. However, I think the next adventure will be in a different area. 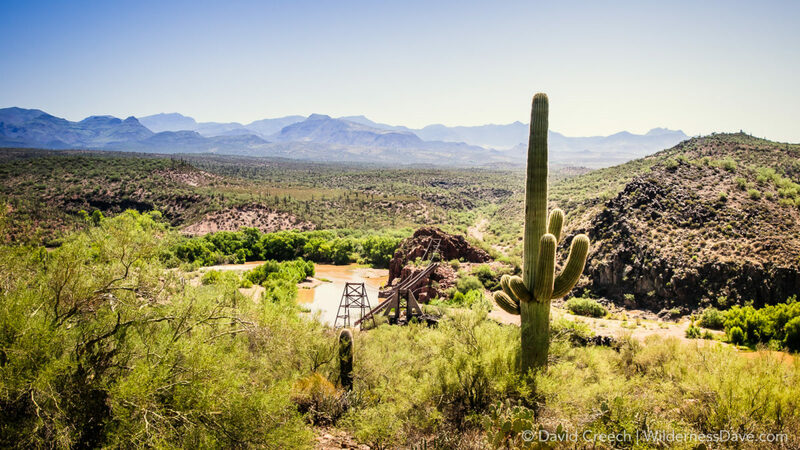 I have really been interested in exploring Castle Hot Springs Road near Lake Pleasant. Not a technical ride, but there are a lot of side trails and backroads of varying difficulty. I just may have to check it out.